When we think of horror movies, our mind tends to jump to the paranormal. Ghosts, monsters, demons, etc. There’s a different type of movie, though, that dominates our nightmares for very different reasons. Certain films are scary not just because of their jump scares and creepy atmosphere. They’re scary because they seem plausible. These are the movies that stay with us because we can so easily imagine them happening to us. The doomed protagonists of these movies are engaging in activities that we are all familiar with. Showering in a new hotel, flying on a plane, even swimming at the beach. We’ve gathered 15 of the scariest plausible movies ever made. For obvious reasons, we tried to avoid movies that were very directly based on actual events. Not only could those movies happen, they did happen, which is a whole other type of terrifying. We've already covered that here. So before you go for a dip in the ocean, or before you leave your front door unlocked, look over this list for a reminder of the scariest worst case scenarios. Here are 15 Terrifying Movies That Could Happen To You. Possibly the most disturbing home invasion film of all time (if not just one of the most disturbing movies of all time), Funny Games set a new standard for terrifyingly plausible films. Centered on an average family, the movie tells the nightmarish story of two young men who break into the home and torture the family, just because they can. Whether you watch Michael Haneke’s original Austrian film, or his own remake ten years later with Naomie Watts and Tim Roth, you’re in for an excruciating experience. The sadistic, nihilistic tone of the film is exhaustingly bleak. The violence is graphic and intense, and the gruesomeness is unrelenting. The entire experience is made all the more horrifying by the fact that there’s no reason for the crimes. The family didn’t wrong the young men in any way. They’re not being punished for transgressions. They’re a normal, healthy family who sadly caught the attention of two maniacs. Funny Games will keep you awake for nights after you see it, and will have you double and triple checking the locks on your doors. There’s a moment of apprehension everyone experiences immediately after boarding a plane. Who will you be sitting next to? The answer to this question means the difference between a pleasant flight and an agonizing journey. The movie Red Eye, directed by Wes Craven, presents the unequivocal worst case scenario for seat partners on a plane. What if the charming young man you shared small talk with before the plane took off revealed himself to be a psychopath, intent on murdering your boss and possibly you? Red Eye flew under the radar upon its initial release, but it has developed a sizable cult following, and for good reason. Craven evokes Hitchcock levels of suspense, expertly utilizing the single location and inherent claustrophobia of being inside an airplane cabin. The film also features terrific turns from Rachel McAdams, and especially Cillian Murphy as the charmer-turned-villain. After seeing Red Eye, you’ll think twice about making small talk with the person sitting next to you on your late flight home. The 1988 film The Vanishing explores the devastating effects a kidnapping can have with a stark, unrelenting frankness. The movie follows Rex and his girlfriend, Saskia, as they travel on holiday in France. They stop at a rest stop, where Saskia enters and then never returns. Years later, Rex is obsessed with her disappearance, and allows his life to disintegrate around him as he fixates on his taken girlfriend. This Dutch-French film is an adaptation of the novella The Golden Egg. The movie becomes more and more devastating and upsetting as we learn the horrific details surrounding the disappearance of Saskia, and the frustration that motivated her kidnapper. The Vanishing is a movie that reminds us how quickly our entire life can turn around. It’s a somber, scary experience that will stay with you for years after seeing it. Just do yourself a favor and avoid the 1993 remake. Before Elsa and Ana sang about letting it go, another movie called Frozen was released with a decidedly different tone. The 2010 Frozen tells the story of three friends who find themselves stranded on a ski lift overnight, alone and cold on a mountainside. This Frozen involves significantly more self-mutilation and wolf attacks than the Disney film. Directed by Adam Green, Frozen gave us a reason to be afraid of ski lifts. Through a series of unfortunate events, the three friends become stranded and increasingly more desperate, left dangling above a snow-capped mountain, with a winter storm fast approaching. The movie is a master class in building tension. The audience is really left wondering what they would do in that awful scenario. Is it worth it to jump? To try and climb the ropes? To wait it out? The scariest plausible movies don’t give us an easy answer to these questions. We’re left thanking our lucky stars that it’s a fictional movie, and we’re safe at home, warm and cozy on the couch. Contagion is the rare outbreak film that doesn’t result in zombies. In the movie, those who are affected with the new disease don’t become walking dead, or vampires, or beasts. They get sick, and they die. That’s it. This makes Contagion one of the most realistic, and most terrifying disease films ever released. Steven Soderbergh expertly juggles multiple storylines, allowing us to learn about the outbreak on a global level. Checking in with everyone from the CDC, to the military, to the small domestic families affected by the disaster, we’re given a full and authentic look at this widespread catastrophe. Horror movies often give the protagonists something to fight back against. With Contagion, there’s no physical being to fight. How do you defend yourself from an airborne pathogen? This makes Contagion utterly plausible and horrifying. The fact that the outbreak doesn’t end in a post-apocalyptic scenario makes it even more realistic. Once the film ends, life goes on, albeit devastated and severly diminished. Now that’s scary. Castaway is obviously not a horror movie. It does, however, contain one of the most singularly horrifying events ever depicted on film. 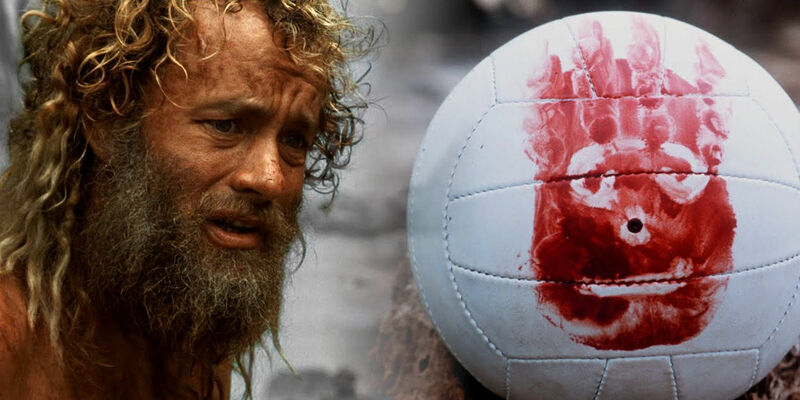 The plane crash that leaves Tom Hanks stranded on the island is presented in such a visceral, jarring way, it has remained seared in our minds ever since we first witnessed it more than ten years ago. Tom Hanks is in the airplane bathroom, looking at something in the mirror. He’s shared small talk with the pilot and co-pilot. They’ve mentioned some possible upcoming turbulence. Suddenly, the cabin erupts in chaos. Hanks is thrown around like a rag doll. The back of the plane rips open. Within seconds, they’re plummeting straight into the open ocean. This scene never fails to illicit jumps from the audience. It’s hard not to watch the harrowing scene without digging your fingernails into your armrest. It’s immensely stressful. And it’s very difficult to forget this scene when you’re experiencing some minor turbulence on an airplane ride. After presenting his irreverent and gleefully violent take on the home invasion genre with You’re Next, Adam Wingard chose to next show us his unique riff on John Carpenter type B-horror movies with The Guest. The movie presents the worst houseguest scenario imaginable. When a young soldier (Dan Stevens) turns up on the porch of the Peterson’s, claiming to be a friend of their late son, they have no choice but to put him up for awhile. But soon the stranger’s charms turn to more and more troubling tendencies. Soon, the family is involved in a living nightmare, fighting for their lives. Seeing a stranger at your door can always be a bit unsettling. Letting them into your house even more so. The Guest does a great job believably setting up a scenario where this family would allow this man to stay with them. We’d do the same thing, in their situation. So when violence erupts, it’s even more terrifying and shocking. That could have been us, we think. Thankfully most awful houseguest stories we’re familiar with involve slobbish behavior and unclean rooms, not massive killing sprees and a tornado-like path of destruction. Ok, with this entry we may be toeing the line of what can be deemed “plausible”. Nevertheless, adopting a child is an experience millions of people go through every year, and this movie certainly presents a worst case scenario for that life experience. After losing their unborn baby, Kate (Vera Farmiga) and John (Peter Sarsgaard) turn to adoption. They choose to adopt a sweet young girl named Esther. Things quickly turn creepy after bringing Esther home, however, and soon the young couple realize they’ve gotten more than they bargained for. There’s a fun, campy quality to Orphan, and the twist at the end is deliciously absurd. We can’t say for certain that this exact case has happened to anyone, but it does play into some primal fears most adopting parents experience. Adopting a child is a loving, exciting, wonderful experience, but there is surely a certain amount of apprehension involved, just as with any new major life experience. The unknown can be scary. Orphan taps into this fear of the unknown and plays it out in joyously disturbing fashion. New parents would probably do well to skip this little frightfest. We’ve all found ourselves in a less than reputable bar or restaurant at some point in our lives. We’re looking for a fun time, and we wind up in a place that maybe feels a little sketchy. Fortunately, most of these experiences leave us with nothing more than a tense evening and a story to tell afterwards. Green Room imagines a much more dire outcome for this kind of night. A punk rock band find themselves playing for another crummy roadhouse in a remote Oregon town. In the green room after the show, however, they realize they’ve crossed paths with a group of murderous white supremacists. Their lousy evening quickly spirals into a violent struggle for survival. Green Room is a harrowing, disturbingly grotesque joy ride through the underbelly of hell. For any artists who make their living by touring on the open road, it may resonate particularly deeply. You never know who may be in the audience of your show. This quiet little thriller premiered at South by Southwest earlier this year and was released on Netflix shortly afterward. Since then, it has generated an impressive horror film fanbase. The movie, brilliantly directed by Mike Flanagan, taps into some very primal human fears of being alone and vulnerable. Kate Siegel plays Maddie, a deaf writer who has moved to an isolated home in the woods in order to find peace. That peace is disrupted by a masked intruder appearing at her door one night. From there, the film weaves shocking twists and turns into its framework as Maddie fights for her survival. Any movie that plays on fears of being attacked in your own home is always going to resonate with viewers. Home is supposed to be a place of comfort and safety, and when that security is infringed by an evil presence, it rocks our foundations severely. Not to mention the fact that most people watching Hush will be watching it on Netflix, in their own home. Let’s hope a masked face doesn’t appear in your window after you turn off the TV. Based on the novel of the same name, Room tells the somber story of a young woman and her son, who spend seven years locked in the shed of the man who attacked and imprisoned her. The movie was a hit with critics when it was released last year, and wound up netting a first Oscar for the wonderful Brie Larson. Room strikes a chord with everyone who watches it. It explores, in sometimes painful detail, the effects that such a senseless act of evil can inflict on the innocent. It’s hard not to see ourselves as Brie Larson’s “Ma” character. It’s rare in film to linger with a kidnapping case for so long. Often, kidnappings in movies focus on the shocking initial act, and then often on the successful escape. Room is a bit of an anomaly, as it spends the majority of it’s time living with the tragic circumstances the characters find themselves in between those two major events. The imprisonment becomes these character’s lives, especially for Jack, who has never known anything except the shed. That’s a profoundly unsettling fear, and it’s hard not to be affected by it. We know what you’re thinking. This list is supposed to be about realistic horror films! What’s realistic about demonic little underground goblins? While the goblin portion of The Descent is unquestionably terrifying, we’re going to be focusing on the scariness that’s set in motion from the opening moments of the film: the act of spelunking in an underground cave, and quickly becoming lost. The claustrophobia on display in Neil Marshall’s harrowing thriller is nearly unbearable. It’s easy to imagine finding ourselves in a similar situation. We’ve got a lovely, outdoor weekend planned with our friends. We’re going to do something new and adventurous. Things quickly turn from exciting and fun to nightmarish and excruciating. For anyone who suffers from claustrophobia, The Descent may be too much to handle. The intense, up-close camerawork never lets us forget that there’s almost no breathing room in these underground caverns. The oppressive rockworks smothers and dwarfs the protagonists. Like them, we as the viewer want nothing more than a gasp of fresh air and the sight of blue sky. What they get instead is a hellish afternoon spent in the bowels of the earth. And, oh yeah, they get attacked by goblins. In some ways, Scream is the most realistic horror film ever put on screen. The characters in Scream are all well versed in horror movie tropes, just like most normal people would be in real life. We recognize scary movie cliches, and we like to think that, were we to encounter those in real life, we’d be smart enough to not go in the dark cellar, or step outside to ask “who’s there?" Scream argues that knowing these tropes isn’t enough. The characters in Scream know the ins and outs of every horror movie, and they still fall victim to the masked killer. The opening scene in particular could be used as a thorough 101 course on how to build and sustain suspense. Drew Barrymore is home alone, cooking up popcorn on the stove and getting ready to put on a scary movie. A situation we’ve all found ourselves in dozens of times throughout our lives. Her phone rings. What first seems like a prank caller from her school quickly reveals himself to be something much more sinister. Soon, she realizes she’s not alone in her house. Famously known as the movie that made us afraid to go in the water, Jaws brilliantly captured the inherent horror of stepping into the ocean. More than just a catchy tagline, the idea of being afraid to go in the water is a historical trend that was initiated by Steven Spielberg’s film. Beach attendance really did dramatically taper in the summer of 1975. Ask anyone who was alive at that time, and they’ll tell you. No one wanted to go in the water after seeing that film. And who could blame them? Jaws captured the terrifying unknown of the ocean like no film before it and no film after it. Spielberg’s wandering underwater camera shows us what we might look like to a Great White skimming the waters below our vulnerably dangling legs. In the water, you’re completely helpless. You’re a tasty morsel for any number of monsters living in the vast expanses of the sea. It’s so easy to imagine ourselves as Chrissy or the young boy. The thought of a 25 foot shark plucking us from our float is enough to chill the blood and keep us out of the water for years. One of the most famous scenes in all of cinematic history is the iconic shower murder from Psycho. What is it about this scene that has imprinted it onto our collective consciousness for more than forty years? Is it the memorable Bernard Herrmann score? The violent and jarring camera angles? Janet Leigh’s performance? All of these things add up to the most terrifying aspect of the scene: this could happen to you. There is an unsettling vulnerability about staying in a hotel. You know that you’re existing in someone else’s space. The setting is completely foreign to you. In Psycho, after that driving rain forces her to take shelter in the Bates Motel, she is at the mercy of the only other person on the grounds: Norman Bates. This brilliant scene has been endlessly discussed and written about. Film theorists will continue to analyze it for years to come. It is the perfect culmination of all the tools in a filmmaker's belt. But most of all, it is the perfect example of a horror movie that we believe could happen to us. What realistic movies scared you the most? Let us know in the comments below!